LONDON--(BUSINESS WIRE)--Technavio analysts forecast the global drilling waste management market to grow at a CAGR of over 4% during the forecast period, according to their latest market research report. The rising investments in shale gas is one of the major trends being witnessed in the global drilling waste management market 2018-2022. Shale is a sedimentary rock formation with natural gas trapped inside. These formations have fine grains and are good sources for obtaining petroleum and natural gas. Shale has low permeability, and it ensures that the gas is not lost through the cracks of the rock. Horizontal drilling and hydraulic fracturing are the techniques used to harness shale gas. This process involves the application of pressure on the shale rock by using a combination of sand, water, and detergents to fracture the rock and allow the gas to rise to the surface. Various drilling and production projects that were planned were kept on hold until the oil prices stabilized. Several exploration and drilling projects across the world were canceled due to these variations in prices. During 2014, the global rig count was high. A decline in the number of active rigs started post 2014 with a sharp decline in 2015 and 2016 during which the crude oil prices reached the rock bottom. The global drilling waste management market research report provides market segmentation by service type (solid control, treatment, recycling, recovery, disposal, and containment and handling) and by region (the Americas, EMEA, and APAC). It provides an in-depth analysis of the prominent factors influencing the market, including drivers, opportunities, trends, and industry-specific challenges. 68% of the incremental growth is expected to originate from the EMEA region followed by the Americas and APAC with 22% and 10%, respectively. 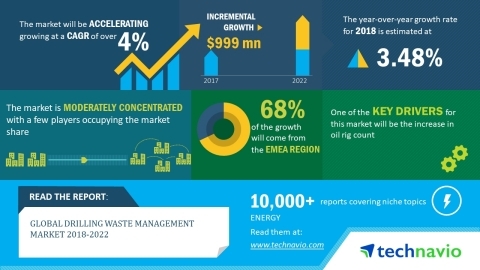 Technavio analysts forecast the global drilling waste management market to grow at a CAGR of over 4% during the period 2018-2022.